The last two weeks have seen the Pitts, Cumberbatches and Witherspoons of the world descend on London, new films in tow, getting that critical buzz going just in time for awards season. Away from the headline-grabbing A-list films, here are five gems I picked out at the 58th BFI London Film Festival. Winter is coming – so say those teases at HBO. But its failure to materialize has given the cast of Game of Thrones plenty of time to make films, and Westeros is well represented here in London. Kit Harington leads in Testament of Youth, his fictional half-sister (or is she?) Maisie Williams stars in The Falling, and Charles Dance joins Benedict Cumberbatch in The Imitation Game. Now, twincest’s Nikolaj Coster-Waldau stars in A Second Chance, directed by Susanne Bier, whose film In a Better World was named Best Foreign Language Film at the 2011 Oscars. Coster-Waldau plays Andreas, a police detective with a beautiful wife and baby son, who discovers that a criminal he’d previously arrested is out, has an infant son, and is putting the baby’s life at risk through terrible neglect. To say much more would be to lessen the emotional gravity the film exerts on the viewer, but I will say that this is an extremely well played, beautifully shot drama, dealing elegantly with absolutely horrifying events. The unflinching, brutal destruction of an impossibly perfect family life is compelling to watch, and it stays with you long after the credits roll. How best to categorise this film? An Iranian vampire western noir romance? Who cares – go see it. Ana Lily Amirpour’s film was my pick to win the official competition – although the towering Leviathan was a worthy winner – and I wasn’t alone in being seduced by this black and white tale of a lonely vampire stalking the inhabitants of the Iranian ghost town, Bad City. There’s a teen romance playing out alongside the blood-letting, but the mood is informed by the prominent pop music used throughout, mixed with long, tense, Jarmusch-esque shots of faces and reactions (this is much closer to his Only Lovers Left Alive than anything in the Twilight saga, for example). The shifts in tone are fast and graceful, and there’s a real whimsy to the film as our hero gets closer to the fang-packing mystery beauty – there’s a lovely scene with him in a cheap Dracula party costume and her on a skateboard that encapsulates the film perfectly. It may be a little too gender-bending to describe properly, so to sum up – go see it. Mads Mikkelsen, Eva Green and Eric Cantona on screen together? At last! Kristian Levring’s western concerns a Danish settler and his brother seeking revenge on the local gang leader for terrible crimes, with the local townspeople too cowardly to help. 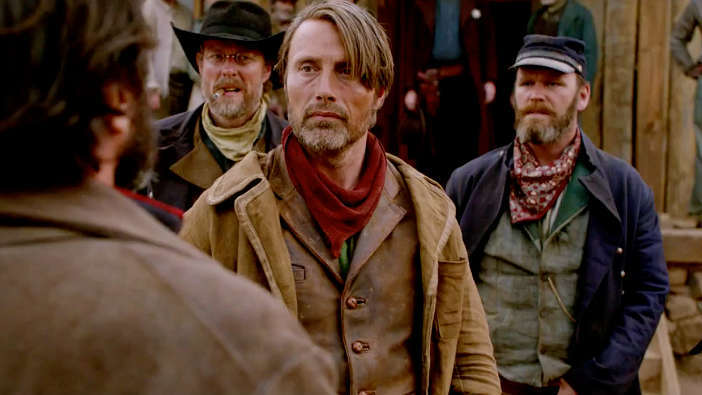 Mikkelsen’s inscrutable face is the wounded centre around which this gripping yarn unfolds, and the support is excellent – Eva Green as a mute, corseted beauty, letting her fierce eyes do the work; Jeffrey Dean Morgan (perfectly cast as The Comedian in Zack Snyder’s questionable take on Watchmen) is having a great time on chief villain duty as dastardly land baron, Delarue; and Eric Cantona is, well, Eric Cantona – a big, burly, beautifully bearded bruiser called The Corsican, punching people and quipping. 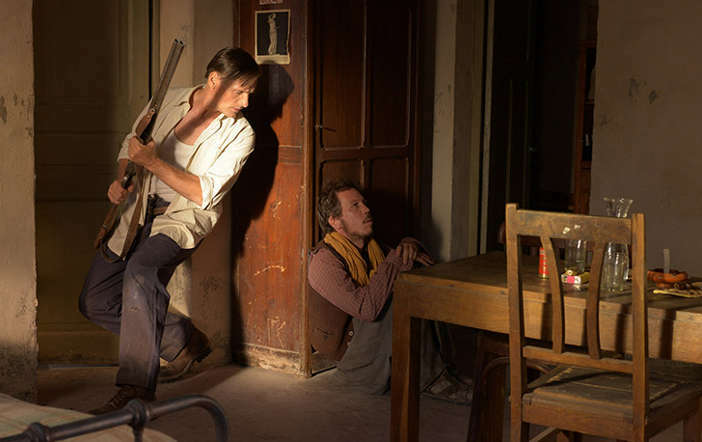 Parachuting so much European action talent into what might otherwise be a fairly by-the-numbers western just works really well, and should more than satisfy fans of the genre. There are few actors working today who are so reliably interesting as Viggo Mortensen. The mere sight of his name above the door gives me a warm feeling inside. This film was billed as an existential western, although I don’t think it qualifies, set as it is in Algeria in the 50s. Far From Men is a loose interpretation of Camus’ The Guest, and it tells the story of Daru (Mortensen), a teacher in a remote school in the mountains who is reluctantly tasked with delivering a prisoner, Mohamed (Reda Kateb, recently seen in Zero Dark Thirty and A Prophet), to nearby Tinguit to face justice for murder. As the men trek through the hills, encountering great danger, each wrestles with his notion of justice, and of right and wrong. Nick Cave’s subtle soundtrack provides the atmospheric backdrop – along with the North African massifs – but it’s Mortensen who shines, as a decent man who must weigh the cost of refusing to take sides. 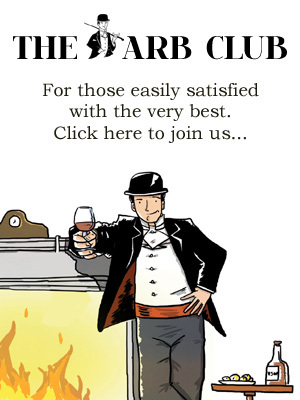 It’s a slow-burn delight. Mohsen Makhmalbaf’s satirical fable tells the story of the tyrannical despot of an unnamed country: a military type in a gilded palace who turns his subjects’ electricity on and off for his own amusement. Unfortunately, his weary populace revolts, forcing him to flee in disguise while the army he presumably indoctrinated in cruelty turns against him and hunts him down. However, he must take with him his young grandson, an innocent boy wholly ignorant of the kind of misery his cuddly granddad has caused to his people. 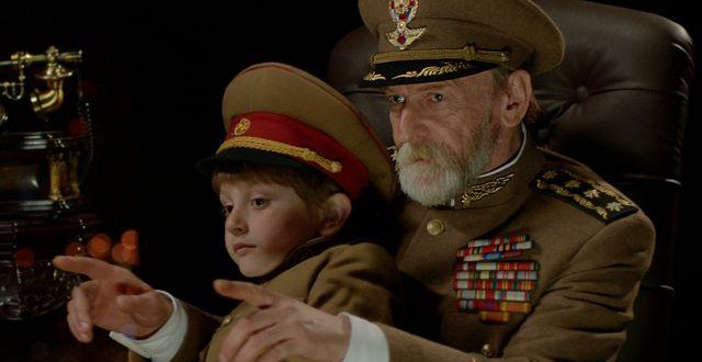 The President, played superbly by Misha Gomiashvili, tries to explain away the peril and secrecy as a game to the little boy, as they dress up as a street musician and his dancing boy and take a tour through the horrors caused by his venal regime and the consequences of its failure. Many scenes are shot through with allegory, and the film’s climactic moments are at once vicious and strangely mournful. It’s a film with a lot to say, but the good grace not to ram it down your throat – a striking piece of work.